Given the current short supply of notable Verdian sopranos, this CD is truly an event. Angela Gheorghiu has shown great promise for the past several years, but how many times have promises of this sort gone up in smoke? One only has to think of Susan Dunn and Aprile Millo and one is sobered. As the old expression goes, "There's many a slip betwixt the cup and the lip." With this disc, Gheorghiu's promise comes a giant step closer to being realized – how good it is to hear Verdi sung with the voice, style, and temperament that were associated with Tebaldi, Callas, and so many others in the 1950s! This program would challenge any one singer. The distance between Gilda and her lyric-coloratura twitterings in "Caro nome" and Leonora's dramatic "Pace, pace, mio Dio," or Aïda's "O patria mia" is enormous. Few sopranos would dare to attempt all three roles, and it remains to be seen whether Gheorghiu will do so on the stage. (Callas recorded them, but not even she sang all of them in the opera house.) Gheorghiu defies the stereotypes, though; her Gilda is no ingenue, and even in this aria, one feels the shadow of death creeping over her. The "little girl" voice is clouded over with sadness. Her Aïda is not an Ethiopian Valkyrie, but a woman pressed down by fate and already broken. One feels the terrible vulnerability in all of these characters – vulnerability is the thread that stitches this program together. Vulnerability is not the same as weakness, however, and Gheorghiu makes each of these characters into women with a distinct and powerful identity, even if the identity is based on oppression. No two are the same. Even otherwise excellent operatic recitals are brought down a notch or two by a singer's failure to characterize and to contrast. Fortunately, no such problem occurs here. Her voice is interesting, replete with colors and shadings that are uncommon today. It's not always a classically beautiful voice, but, like Callas, Gheorghiu has made a virtue out of necessity. (One hopes that Gheorghiu's resources hold out longer than Callas'!) She has what is needed to be a great Verdian singer, however: excellent breath control and legato for the spinning of long lines, power, and expressivity at any volume. Gheorghiu reveals her artistry in the passages that other sopranos just push aside: for example, in Leonora's conversation with her confidante Ines (leading up to "Tacea la notte placida") and in Desdemona's nervous asides to Emilia as she prepares for bed. 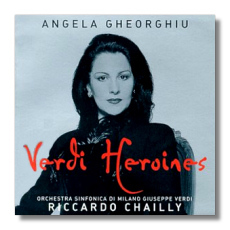 Chailly is an excellent partner for Gheorghiu, taking nothing for granted in Verdi's music. He has prepared the orchestra (and, I assume, Gheorghiu) with tremendous care, but without removing an iota of excitement from the music or from the performances. Ten years ago, I thought him an overrated conductor, but his recent operatic recordings show that he could "own" the Puccini and Verdi operas in the coming decades. Decca's engineering is ideal, and the booklet contains texts and translations of all the arias. For the love of Verdi, do not miss this CD.